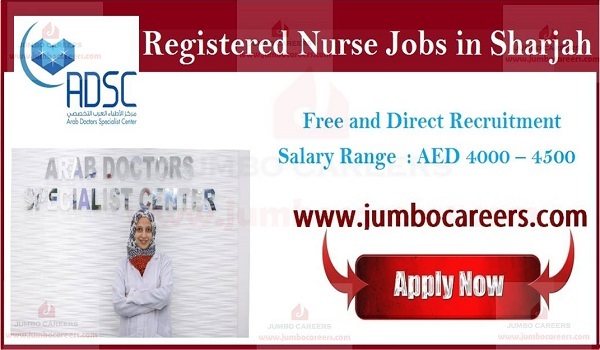 Arab Doctors Specialist Center Sharjah conducting latest interview for hiring registered nurses. Its a free and direct recruitment by the company. Education : Degree or Nursing Diploma. 4. Assures quality of care by adhering to therapeutic standards; measuring health outcomes against patient care goals and standards; making or recommending necessary adjustments; following hospital and nursing division’s philosophies and standards of care set by state board of nursing, state nurse practice act, and other governing agency regulations. Address : Arab Doctors Specialist Center, Al Taawun Street, Near Sharjah Islamic Bank, Sharjah.